Well the Democrats apparently just liked the music and not the words. Because no where in that song did it say turn off the heat and watch them suffer through the day. But that happened at several Baltimore city schools. The Baltimore Teachers Union sent a letter on Wednesday to Sonja Brookins Santelises, the chief executive officer of Baltimore City Public Schools, saying that this week students and teachers have endured dangerously low temperatures in buildings that are struggling to operate with bursting boilers and drafty windows. “Trying to provide a stable learning environment in these extreme conditions is unfair and inhumane, to say the least,” said Marietta English, the president of the union, in the letter, which was published in The Baltimore Sun on Wednesday. That day, four schools were closed and three let out their students early because of the heating issues and cold in their buildings. 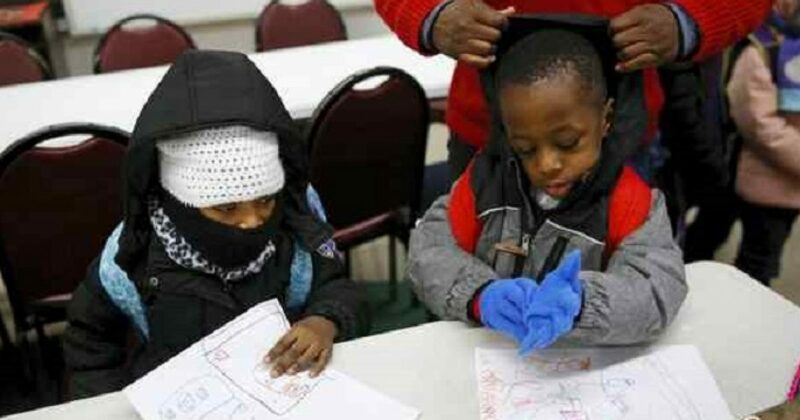 Many students are forced are to attend classes bundled up in hats, scarves, gloves and jackets. These kids look as if they’re headed out to build a snowman. Instead, they’re headed to class for more of that stellar government indoctrination, that’s if they can stand the cold. Now, teachers are calling for the schools to be closed until the heating issues are addressed. Meanwhile, parents starting raising money on their own in an effort to address the situation. Update: yesterday we raised 8,000$ of our $20,000 goal to get space heaters and winter coats for the kids in the affected schools. Thank you to everyone that has donated so far. Let’s keep this going. School is closed today so I will be collecting items myself. He undoubtedly meant the schools as well. However, entire cities are failing. And Democrats only have themselves to blame. Leftists run the unions, the schools, and even the police force. Thus, it should come as no surprise that Baltimore declares itself a sanctuary city. And you can bet the illegals feel the comfort of the city, as the children of citizens freeze in school. Baltimore can’t even say they’ve attempted to address the problems taking over the city. They cashed in government grants to clean up the worst neighborhoods, accomplishing nothing. Only the downtown store fronts were scrubbed clean. A few blocks east or west, and you will see one of America’s worst cities. You can bet the people of Baltimore would love to blame some rich white Republican man for its woes. However, Baltimore hasn’t taken a chance on a Republican mayor since the 1960s. Further, their entire city council are Leftists. When Donald Trump mentioned inner cities on the campaign trail, Baltimore acted offended. They don’t want to admit their murder rate is second only to St. Louis. This stellar record of achievement occurred under the watchful eye of Baltimore’s 30-year Congressman, Elijah Cummings. Instead of seeing Elijah Cummings for the failure he represents, the fake news media paints him out to be a bold, incredible leader. If failure is your measuring stick, Cummings leads by far. Now, school children pay the price. They sit in classrooms that resemble Siberia, or some Third World countries. And they have the nerve to criticize home-schoolers. And, you can bet most kids in the suburbs aren’t sitting in the freezing cold.